This BioProvince (as defined by Armen Takhtajan) is named after Nama (the plural being Namaqua), which is the name of the Khoikhoi people that lived here at the time of the first white settlement. It forms a narrow deeply dissected escarpment inland of the Namibian BioProvince that gradually widens in a southerly direction to eventually develop into an extensive plateau south of Windhoek. The Orange River divides the region into Great Namaqualand (in Namibia) and Little Namaqualand (in the Northern Cape). The southern border extends for a few kilometres south of the Orange River and stretches between Vioolsdrif in the west to Upington in the east. To the west of the town of Windhoek it includes the Hochland Plateau that varies from rugged in the north (with broad valleys and inselbergs) to a flat and stony plateau dissected by deep valleys in the south. Also included is the Brandberg one of Namibia’s highest mountains at 2,038 m while other mountains such as the Baynes, Erongo, Naukluft, Spitzkoppe and the Gamsberg lie along the escarpment edge. The southern Kalahari is also part of this BioProvince but this area is probably sufficiently distinct to represent a sub-bioprovince in its own right. Rainfall is low and mostly falls as thundershowers in summer months but there is great variation between years and humidity is generally very low. Temperature can range from -9°C to over 40°C in places and winter frosts are common. The zone is an area of high endemism for plants and various animal groups and the northern part, the Kaoko Escarpment, is regarded as endemism ‘hotspot’ with extremely high species richness and endemism. Many endemics are also clustered around the Brandberg Mountain (an isolated relict inselberg) and around the Khomas highlands north of Windhoek. The high altitude of Brandberg together with the cool, moist conditions at its summit are likely to be factors contributing to its high level of endemism. Two of the more notable endemic plants are Brandberg acacia (Acacia montis-usti) and the Brandberg euphorbia (Euphorbia monteiroi subsp. brandbergensis). Other endemics or near endemics in the Brandberg area include the monotypic genera Phlyctidocarpa and Kaokochloa (Poaceae) and species such as Barleria lichtensteiniana, Berkheya chamaepeuce, Euphorbia gariepina, E. gregaria, E. avasmontana, Panicum arbusculum, Stachys burchelliana, Schotia afra, Zygophyllum dregeanum, and Z. microcarpum. A number of Brandberg species appear to be relicts of an ancient arid flora and now have disjunct distributions among the arid areas of the Karoo-Namib region and the Saharan area of the Sudano-Zambezian region. This suggests that at one time there was a continuous arid belt stretching across Africa from Somalia to Botswana, Namibia and South Africa. The vegetation is very varied in structure, physiognomy and species distribution reflecting the diverse topography and varied microclimates but it can be broadly divided into mopane savanna, semi-desert and savanna transition, and dwarf shrub savanna. 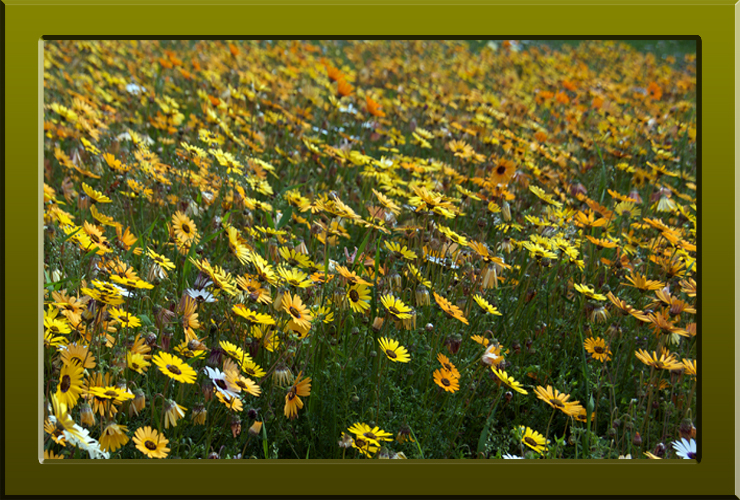 Namaqua marigolds (Arctotis spp) can produce magnificent displays of yellow, orange, red and white in Namaqualand during spring (Copyright © 2010 Peter Martin Rhind).